The theme of non-communication in human relationships in a world saturated with information is the connecting thread in this collection of stories. The mystery of light in Vermeer's famous painting inspires a writer; a travelling lingerie salesman is helped by a rock musician as he waits for his runaway son; an emigrant describes his experiences in Havana to his nephew; a thief, killed while robbing a bank, recounts his love story. Non-communication in a world saturated with information is the connecting theme in this lively collection of stories by the author of The Carpenter's Pencil. 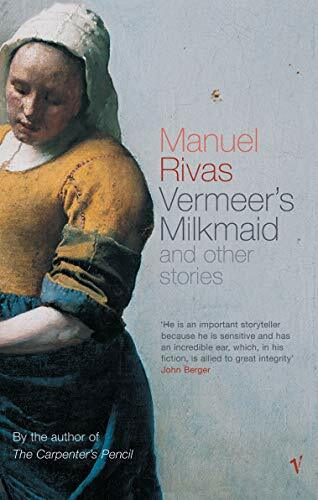 The everyday lives of Rivas's unforgettable characters may be desperate and harsh, filled with pain and solitude, but humour and tenderness always redeem them. Vermeer's Milkmaid includes the three stories that comprise Butterfly's Tongue, upon which Jos- Luis Cuerda's acclaimed film of the same title is based.